There was a slight problem with last week’s show, but it will hopefully turn up at some point. 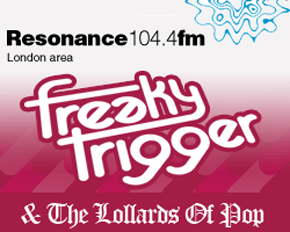 In the meantime, here is this weeks Freaky Trigger and The Lollards Of Pop which for once is serious about the serious and silly about the silly. Pete Baran is joined by Anna Fielding, Katie Grocott and Hazel Robinson to talk about the youth of today, yesteryear and show the presenter to be far too old with his pop culture references. Music from Bjork, Musical Youth, Chase & Status and Debbie Gibson. Of course. On Resonance FM, Saturdays at 2:30. Lollards be droppin' science so you can pick it up again. Listen online or on 104.4fm if you are in the magic land that can receive it via realactual Maxwellian radio waves. A Crow Flies North 9 Apr 2011 I've been CHEATING ON Freaky Trigger over the last week with the One Week One Band blog, writing about the KLF. You can read all five days' worth here.